Managing wood smoke is critical to the success of smoked meats. Here's a quick tip that ensures that you get nice even wood smoke as long as the fire lasts. If using a charcoal grill wood chip providers typically recommend that users soak wood chips for about 30 minutes then sprinkle the chips on the coals after they've had a chance to burn down to a manageable temperature. Often times when chips are sprinkled on the coals or when they don't fully soak the wood will tend to burn faster creating a quick burst of smoke that does not last. The result very little of the smoke actually spreads to the meats. The answer is quite simple. Once wood chips have fully soaked place them in a tin can wide enough and tall enough so that it will fit neatly below the grill surface and will capture all your chips. Place the can in the middle of the coals seated flatly on the bottom rack of the grill. Once placed the heat will cause the wood to begin smoking providing excellent smoke throughout the cooking cycle. 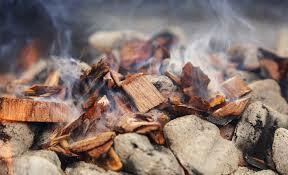 If you need more smoke hold some of the wood chips aside keeping them in water. When the fire burns about halfway through the cooking cycle add more wood chips into the can. The process of Wood Smoking is relatively simple when thoroughly understood. We hope we've helped further your knowledge of the process.